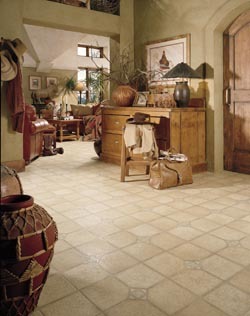 For a style and durability upgrade in your home at a price you’ll like, consider vinyl flooring. The vinyl category of flooring encompasses a number of flexible options in vinyl, including luxury sheet vinyl rolls, vinyl plank floor options (LVP), and luxury vinyl tile flooring (LVT). All of these choices have the same vinyl advantages: ease of maintenance, durability, and affordability. Vinyl flooring is appropriate for any application in any room of your house, but the durability of vinyl makes it a great option for high-traffic areas like the kitchen or hallways. Busy households will appreciate the ease of maintaining these floors. Regular sweeping and mopping will keep your vinyl flooring installation looking brand new throughout its lifetime, and luxury vinyl is highly stain and scratch resistant. New luxury vinyl is eco-friendly, as well. The old-fashioned manufacturing process for vinyl was not efficient, and some older vinyl flooring even used asbestos. Fortunately, modern advances in technology and manufacturing techniques have made vinyl one of the greenest floor options at an affordable price. Luxury vinyl plank floor (LVP) options have all the advantages of vinyl sheets while also being easy to install. This vinyl flooring can simulate boards of any natural material, including hardwood of all varieties and color. Unlike sheet vinyl, a vinyl plank floor does not have to be cut around the walls and vents of your room. This speeds up vinyl floor installation dramatically, and makes removal of individual boards for repair or replacement fast and easy as well. Come in to our fully stocked showroom and let our flooring experts help you choose your next vinyl floor. We have the ultimate selection in low-maintenance vinyl flooring, including vinyl plank floor options. Our Price Protection Guarantee makes sure you get the absolute best price on our affordable flooring. We will refund the difference in price to you instantly if you find a lower price on the same brand and style within 30 days of your vinyl flooring purchase. Luxury vinyl tile (LVT) combines the advantages of sheet vinyl with the flooring installation speed of vinyl planks, often proving the most flexible option for any space. Vinyl tile and plank flooring is composed of four layers compressed together by pressure to form a durable sheet that can be cut to various sizes to fit any space quickly and on any budget. The protective wear layer is the stain and scratch-resistant top layer that gives vinyl unmatched durability in all conditions. The clear film layer prevents rips and gouges from marring your vinyl flooring. The printed design layer can be any pattern or color. This means that your vinyl tile or vinyl plank floor can simulate any natural material, including ceramic, porcelain, slate, and limestone. The backing layer adds strength, water resistance, and a firm foundation to your vinyl flooring installation. Your confidence in your vinyl flooring selection is guaranteed with the help of our Five Star Selection System, offering 5 to 25 year warranties on wear, fade, and stain resistance. All of our vinyl flooring installation is backed by a lifetime installation guarantee. We promise to repair any installation-related issues for free. Rely on our Confidence Plus™ Warranty when you purchase four or five star sheet vinyl or luxury vinyl tile flooring for 60 to 90 day installation guarantees. If you don’t love your new vinyl plank floor, we will replace it with a floor of equal value with no cost to you. Contact us at <PHONE> to find the perfect vinyl flooring for any room of your house. Invest in the low-maintenance durability and style of luxury sheet vinyl or vinyl tile or plank flooring. We serve many customers throughout Lincoln, Loomis, Roseville, Granite Bay, and Rocklin, CA, plus the surrounding areas.